There are many types of equipment used in the drilling and processing of oil and gas, and they are important for the survival and effective functioning of the oil industry. Many of these instruments, such as oil field pump equipment that use horizontal and vertical pumps, require a geared device. These devices can change the speed, torque, and direction of a power source through the teeth of the gears. The device preserves the input power and simply trades off forces against movement to obtain a desired amplification in the output force, creating a mechanical advantage. To produce these cogwheels or gears, specific machining is needed to cut the teeth into the workpiece, this machining process is referred to as hobbing. 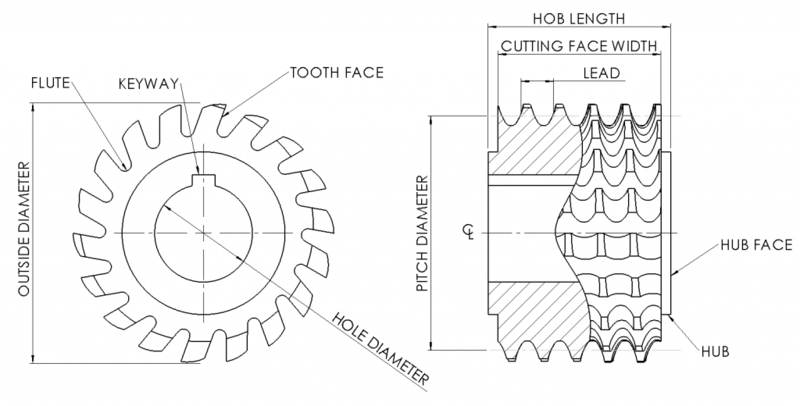 The Defining Dimensions of a Hob Used for Machining an Involute Gear. Spur Gears, the most common and efficient type of gear, is used when the application of transmitting power and uniform rotary motion from one parallel shaft to another is required. This gear is also known as a straight gear. Helical gears, a type of cylindrical gear, have teeth that are set on an angle to the gear axis. The features and benefits are similar to spur gears but can be a better option when higher velocities are needed. They have greater tooth strength, a higher load carrying capacity, and a smoother and quieter operation due to their higher face contact ratio. Gear pumps are one of the most common types of pumps for hydraulic fluid power  applications. They are positive displacement pumps, meaning they pump a constant amount of fluid in each revolution. Parallel key splines have equally spaced, straight-sided grooves that are parallel in both the radial and axial directions. This type of spline is similar to a keyway drive, with the exception that the keys are integral to the shaft and equally spaced around the circumference. The outside diameter of the shaft and major diameter of the internal spline or the minor diameter of the internal spline and the minor diameter of the shaft. Involute splines also have equally spaced teeth, but the teeth are involute and usually not as tall. The involute form and the lowered height increase strength by decreasing stress concentration as well as the possibility of cracks due to fatigue. Involute splines come in several varieties: Flat root side fit, fillet root side fit, and major diameter fit. Crowned splines are usually involute splines whose teeth are crowned or curved to compensate for angular misalignment. Usually, the tooth has a symmetrical crown about the centerline of the spline face-width. At this centerline the tooth thickness is at its maximum. Moving toward the ends the tooth thickness gradually decreases, with the thinnest sections occurring at each end face. Serrated splines have teeth of the male detail are in the form of an included angle, with the female serration having spaces of the same included angle. Serrations are generally used on smaller diameter drives, where an involute form would not add strength. This shape allows for more teeth on a smaller shaft circumference and providing greater contact area. Helical splines have equally spaced teeth that form a helix around the shaft. The helix enables better load sharing of rotational torque along the length of the shaft and is therefore used in applications of high torque. We are a unique specialty Metals Service Center specializing in quality High-Quality Alloy and Nickel Alloy metal products and are the experts in Pump Shaft Quality (PSQ) long bar products. See the full list of specialty alloys and capabilities Double Eagle Alloys offer and let one of our experienced team members assist you.